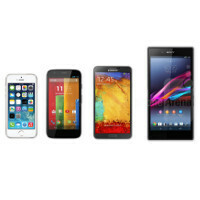 Poll: What is the perfect smartphone display size for you? Ever been asked by a family member for a smartphone recommendation? If yes, then the chances are that you, in turn, started asking questions so that you can narrow down the list of possible suggestions, and one of them almost assuredly had to do with display size. Indeed, the diagonal of the touchscreen glass is among the most important criteria people set when shopping for a new smartphone, and that makes a lot of sense. Do you want to lug around a true phablet-sized monster that can essentially double up as an on-the-go media hub, or are you more comfortable with a sub 5-incher that fits in your jeans' pockets? Let us know by voting for the screen size bracket that you find closest to optimal! (March 2015) What is the perfect smartphone display size for you? It's not about screen size. It's about the width and thickness of the phone. For me, it should be less than 70 mm wide and 8 mm thick. Within those dimentions, bigger screen is better. I agree with the 70mm but height is a big deal too. Phones with too much bottom bezel make it hard to reach the top of the screen. If I want to use both hands, I'll use my tablet. Generally speaking 5" is max for me. I lov emy Nexus 5 but I couldn't go bigger. I'm looking forward to the Z4 Compact. Height less than 145 mm is pretty good for me. Agree with both things. For me 5" with off screen buttons and 5,2 max if it has on screen buttons. Yup, same here, I want the phone to be manageable. If only they released a 5 inch or less nexus again I would buy it in an instant. The only other option is the Z4C otherwise (unless it isn't water proof, then the rest of the features will compete with S6). This question have been ask. The answer is still the same, 5" to 5.5"
Is it just me or PA made the same poll for every year? I voted 5" to 5.49", it's perfect for me. 6" is the limit. But I guess if some manufacturer make a phone with 6" screen with very thin bezels, and has a body size like a 5.5", that would be awesome. Yes but I guess they want to map how popular opinion changes year on year. If you flip your hand really fast you can fly, don't you? 5.5 to 5.99, perfect for me. I use my Note 4 one handed easily, same with a friends Note 3 and LG G3, anything lower than 5.5 is too small for me now and anything above 5.99 may be a little more difficult, still want to try a +6inch phone for a week or so though to see how I will feel about going over 6inch. I did try a Lumia 1520 for an hour or so, didn't mind it. For me Galaxy S4 size was perfect. Screen size and overall device size was perfect . 4.5" – 5.0" idea size for me. What is more, only for the home. just exactly 5.5" is for me. I moved from Note 3 to Galaxy S5 and size wise I don't regret this ! Definitely the 4"-4.49". My iPhone 6 is just a tad too big to be comfortable to use one handed. Using my mum's new iPhone 4S makes you realise just what we're missing as far as comfortable one handed use. 4.5 to 5. I used to have a Note 2 moved to the bigger One Max, got tired switched to a smaller Note 3, got tired switched to smaller S5. Still not satisfied, I switched to my Z3 Compact I am using now. Perfect. Will hold on to this until it breaks or I will see how Z4C will be. I feel like my ideal size will keep growing. After trying a friends 1+1, my S5 felt puny.